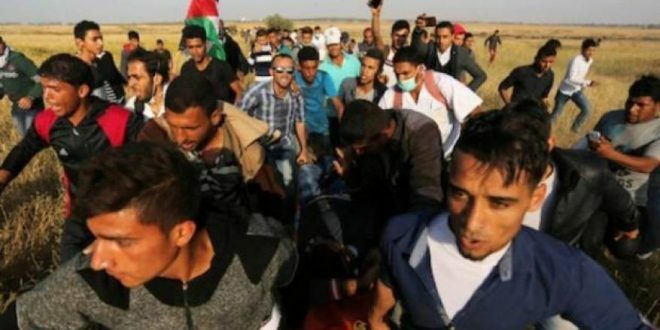 A Palestinian man on Sunday early morning was announced dead due to wounds he sustained during the Friday protest at the Gaza border, in which five others were killed and 230 injured. According to a spokesman for the Ministry of Health in Gaza, Ashraf al-Qadra, Yahya al-Hassanat, 37, from Al-Mugharaqa town in Central Gaza strip, passed away due to serious wounds he sustained after he was shot by live ammunition. On Friday alone, fivee civilians were killed and more than 230 were injured by the Israeli occupation forces’ repression of peaceful marches in the eastern Gaza Strip. Overall, 208 Palestinians have been killed since the start of the protests on 30 March, and over 20,000 have been injured by live ammunition, rubber-coated metal bullets and teargas.